Get Hands-On Experience with the All-New CUT READY 43 at IWF 2018! 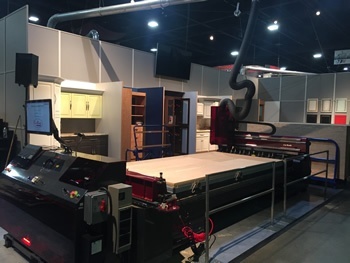 The 2018 IWF Show (August 22nd-25th) promises to be an exciting opportunity to visit Atlanta and see the very latest technology from Thermwood (booth #6735)! Like the all new CUT READY 43 and the award-winning CUT CENTER (both help you quickly and easily create most products a cabinet shop would want to make without a CNC programmer) and the heavy-duty MODEL 45 machining solid wood, aluminum and plastic sheet parts. New CUT READY 43 - With Artie Inside! Thermwood is proud to introduce our all-new CUT READY 43 (shown above equipped with a 5 by 8 table, optional 21-position tool changer and lift vacuum cups and a standard high flow vacuum hold-down system - additional table sizes and options are available). This machine has many of the features of the CUT CENTER, but at a lower price. Just like a CUT CENTER, it also can help you quickly and easily create most things a cabinet shop would want to make without a CNC programmer, but unlike the CUT CENTER, it does require a trained and somewhat skilled machine operator. The CUT READY 43 will be in action at IWF 2018 in booth #6735. Both of these machines in our new Cut Ready Series are equipped with Artie Inside. 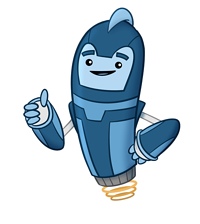 Despite the cute name, Artie is actually a cutting edge, artificial intelligence engine inside the Cut Ready control. You tell him what you want and he creates a program to make it. These are not pre-programmed libraries. No part programs exist in the control until Artie creates them. This is nothing less than a bold next step in the evolution of the CNC router. Artie is already capable of programming tens of millions of unique products and is constantly learning how to make and do more and more new things. Artie is easy enough that virtually anyone can work with him with little or no training. Try out the award-winning CUT CENTER for yourself at IWF 2018! The CUT CENTER is the ultimate in next generation CNC routers. It doesn't require programming and most people can operate it with little or no training or guidance. It is complete, fully contained with all the ancillary equipment, smoothly integrated into a package that almost runs itself. Artie guides you through each step of the production process. If there is anything you don’t understand, he will show you a video of what to do. He manages your tooling and keeps track of routine maintenance. He will show you a video of how to clean filters or top off lubrication. He will turn your vacuum pump on or off as needed and will make sure it is holding properly. Should you encounter a problem he will guide you, step by step, through a solution. 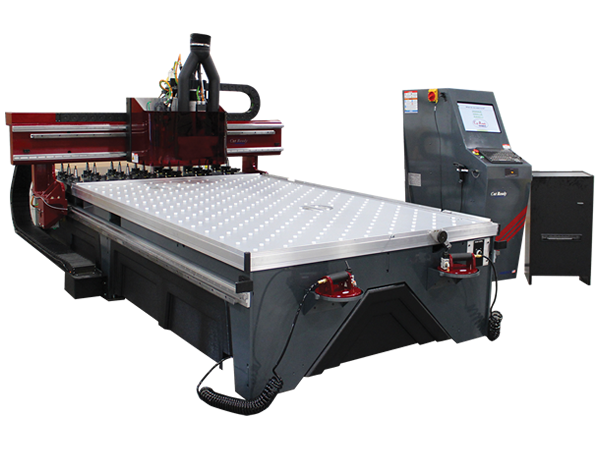 Just like the CUT READY 43, you can operate the CUT CENTER as a traditional CNC router. However, running with Artie represents a whole new way of operating a machine which must be experienced to be completely understood. It is just so easy!. The CUT CENTER is the ultimate in next generation CNC. You'll have the opportunity to see just how easy it is to run this powerful machine. Just tell it what you want, and it makes it...it is that easy! We'll be demonstrating live during the show, and you can be part of it by helping to operate the CUT CENTER. 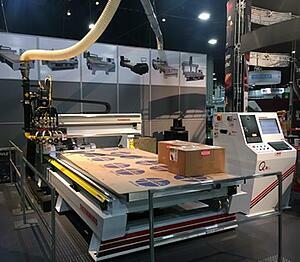 Please visit our booth (#6735) and speak to a Thermwood representative to get your hands on this exciting machine! 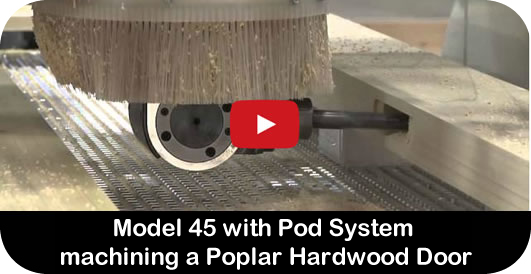 We will also be demonstrating solid wood, aluminum and plastic sheet parts on the Thermwood MODEL 45. See in operation at IWF 2018! The CUT READY 43, the CUT CENTER and the MODEL 45 (making solid wood, aluminum and plastic sheet parts) will all be on display and cutting live at IWF 2018 (August 22nd-25th) in Thermwood booth #6735 at the Georgia World Congress Center - Atlanta, GA. or contact us at 800-533-6901 for more information. Make plans now to visit us and see this exciting new technology in person!